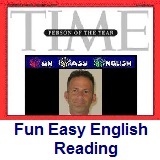 ﻿ Fun Easy English - reading practice and learning about the holiday Daylight Saving Time Begins. Daylight saving time (DST)—also summer time in British English— is the practice of advancing clocks during the lighter months so that evenings have more apparent daylight and mornings have less. Typically clocks are adjusted forward one hour near the start of spring and are adjusted backward in autumn. The modern idea of daylight saving was first proposed in 1895 by George Vernon Hudson and it was first implemented by Germany and Austria-Hungary starting on 30 April 1916. Many countries have used it at various times since then. Much of the United States used DST in the 1950s and 1960s, and DST use expanded following the 1970s energy crisis. It has been widely used in North America and Europe since then. The practice has been both praised and criticized. Adding daylight to evenings benefits retailing, sports, and other activities that exploit sunlight after working hours, but can cause problems for evening entertainment and other occupations tied to the sun (such as farming) or to darkness (such as firework shows). Although an early goal of DST was to reduce evening use of incandescent lighting (formerly a primary use of electricity), modern heating and cooling usage patterns differ greatly, and research about how DST currently affects energy use is limited or contradictory. 1. What is daylight saving time called in British English? 2. Typically clocks are adjusted forward how much in Spring? 3. When was the modern idea of daylight saving was first proposed? 4. The practice of daylight saving time has been which of the following? 5. Research about how DST currently affects energy use is which of the following?